One box, no compromises: meet the Roberts S300 wireless hi-fi system | What Hi-Fi? Your Music. Rediscovered. Relived. Reloved. Founded in 1932 by friends Harry Roberts and Leslie Bidmead, who funded their small factory in London using the proceeds from the sale of Bidmead’s motorbike, it quickly rose to prominence as a purveyor of high-quality portable radios. Roberts and Bidmead’s founding philosophy – never compromise on quality, keep pushing the boundaries – has persisted through the 85 years that have followed. This boundary-pushing has seen the brand expand far beyond those initial radios to embrace new technologies, new connectivity, and new design and engineering. Alongside the iconic Revival retro radio, based on a 1956 design but with bang up-to-date technology, Roberts offers integrated music systems, streamers and cutting-edge wireless speakers with multi-room capabilities. And now, the brand so closely associated with ‘the wireless’ has taken wireless technology to a new level. The full gamut of Roberts’ knowledge of audio engineering is apparent in the R-Line range of wireless speaker systems, and especially its flagship: the Roberts S300. Roberts’ S300 promises to be the only audio solution you need. It’s not just a music player; it’s the cornerstone of a home-wide music streaming system. Inside its weighty chassis is extensive connectivity and media playback functionality. It’ll connect to your home computer via Wi-Fi and stream all the files you have stored on it, with effortless setup courtesy of the UNDOK app (available for iOS and Android). It has built-in Spotify Connect, allowing it to draw the highest-quality streams direct from the music service. 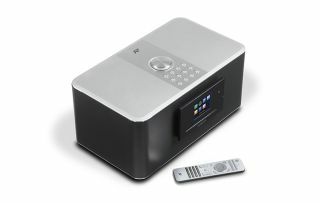 It can play music files you have stored on USB and SD card, and stream songs from a Bluetooth-connected smartphone, pairing with a tap thanks to NFC. It even has a CD player. And then, of course, there’s the radio bit. In addition to FM, DAB and DAB+, the S300 features an internet radio client, offering access to over 20,000 stations from around the world. It’s all controlled via a large, full colour display, and – unlike many competitors – built-in physical controls. But the S300 is not an island. You can twin it with additional R-Line components as part of a multi-room wireless streaming system. You can build your system in a way that suits you, and control it all via the UNDOK smartphone app – or, uniquely, using the buttons built into the R-Line speakers. The Roberts S300 is every bit the premium music system. With a simple, elegant, aluminium-clad design and high-end fit and finish, it’s crafted to impress. As you’d expect from a brand with 85 years of audio heritage, there’s real hi-fi engineering inside the 42cm-wide chassis, too. Twin tweeters and mid-bass drivers, augmented with a pair of passive radiators, provide the audio capability, while built-in tone controls and a five-position equalizer allow you to optimise the sound to your listening environment. In short, the Roberts S300 is the complete music system, capable of working however you want it to. An illustration of what it means for an audio company to forego compromise and push boundaries in 2017, just as that burgeoning portable radio brand did back in 1932.